Our range of products include Wooden Bed Sides such as Wooden Bed Side and Wooden Bed Sides Tables. 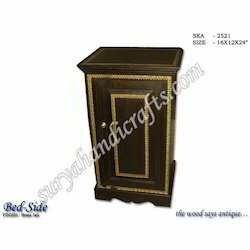 Wooden Bedside Cabinet offered comes in smooth polished as well as seasoned wood finish for durable and lasting usage. Further, the beautiful presented ethnic decorative styles on the front panel and door also provides for enhanced decor support. Some of its features include choice of different finish sizes and widths to choose from; polished knob support for easier opening and closing of the cabinet doors; suitable to be used at homes, hotels, resorts as well as other similar places; exciting design options; perfectly match up with aesthetic needs of customers.